Let’s start this recap off with saying I miss being in the south. I am going back to my desire to move and getting my crap together to head south of the Mason-Dixon. People are so polite. 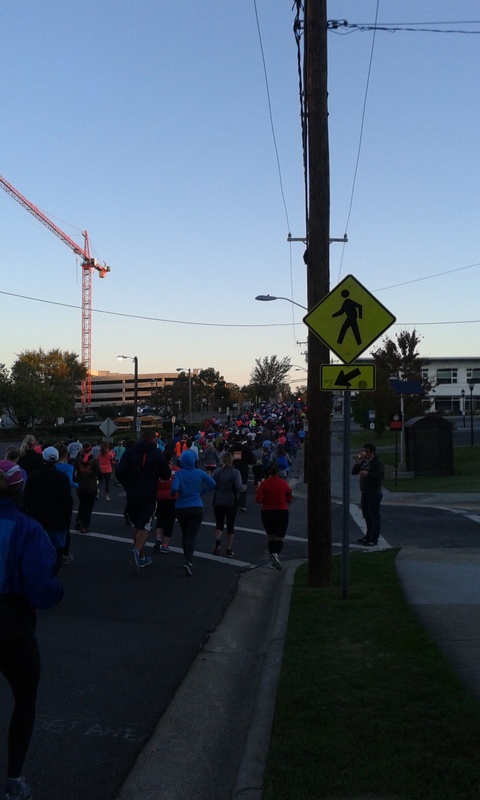 We’ll start the day with it was cold by North Carolina standards when the sun started rising on race day. Julie, who happened to follow my daughter and I out of the parking garage, and I found a building we could go in to keep warm. I was diligently looking for my friend Paul who lives in the Triangle, as he puts it. A guy who looks sort of like Paul – just an FYI, I do not wear my prescription glasses to run – came walking past us and I said “Hey, Paul!” He stopped, gave me a hug and preceded to hold a conversation with me. Yup! You guessed it. He was the wrong Paul. Never met this guy before. Suddenly, men named Paul were all around me but not the right Paul. I traveled over 500 miles for a race and never managed to find the right Paul before or after. I will say the wrong Paul early on gave my new friend Julie a good laugh. And after that, there was a Paul standing near Julie and I. A Paul asked me to take a photo pre-race. 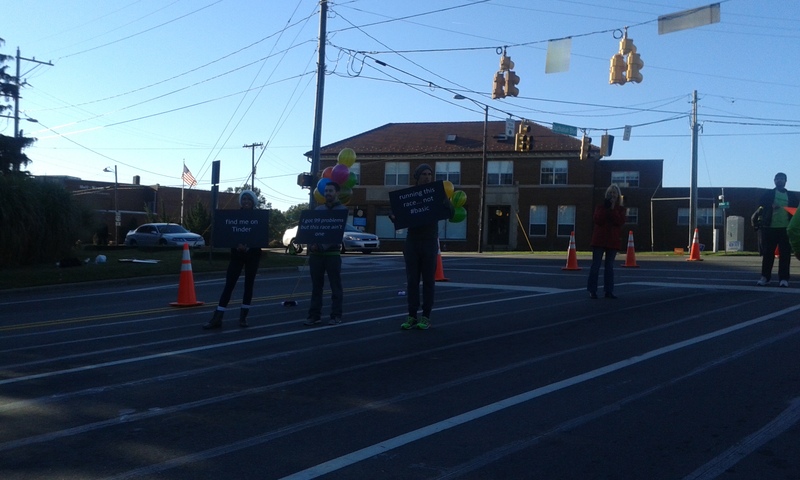 Taken pre-race as I wouldn’t think to take it at mile 13. The race started right on time. I am not certain of the total number of five mile and half marathon runners. These two races started together at 7:30 am. I do know that it took me about eight minutes to get to the start line. My daughter was right there near the start and I told her when I estimated I’d be back for the finish. The course was full of rolling hills – 13.1 miles of them. Add to that the start of two races at once and it lead to crowded Durham streets for quite some ways. Being a huge “Bull Durham” fan, I was really excited when I heard someone behind me say we were running past the old Bulls stadium. I had to haul myself off to the side of the road to get a photo. I got through the first five miles in just about an hour. I ran a bit of this leap frogging a fire fighter and his running partner. He was running in turnout gear. They finished about 12 minutes ahead of me – I’m presuming they finished together. 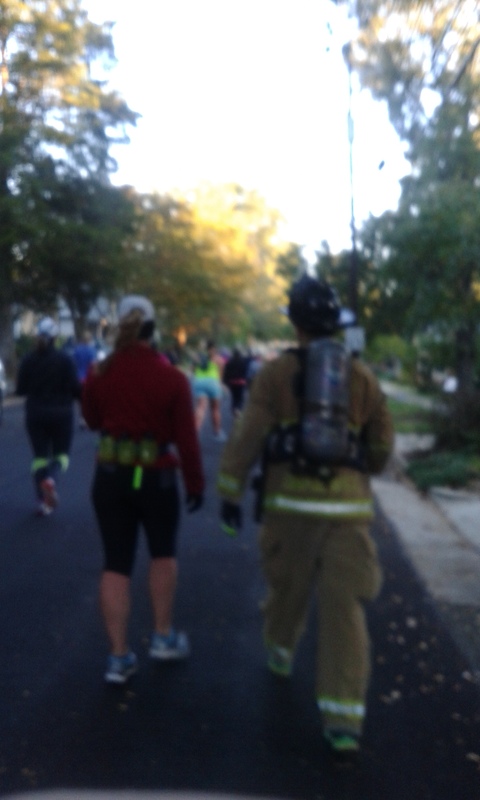 13.1 miles dress in turnout gear is amazing. Some of my favorite parts of races are the conversations. I have truly serious runner friends who think talking to those around during a race just takes away from your time. I do not see it that way. I like to connect with people. About mile 2 or so, I had a brief conversation with two guys running behind me. They were talking about serious relationships and commitment. It was hard to keep my two cents out but I just listened. We talked about pace and one even said he was running my pace. 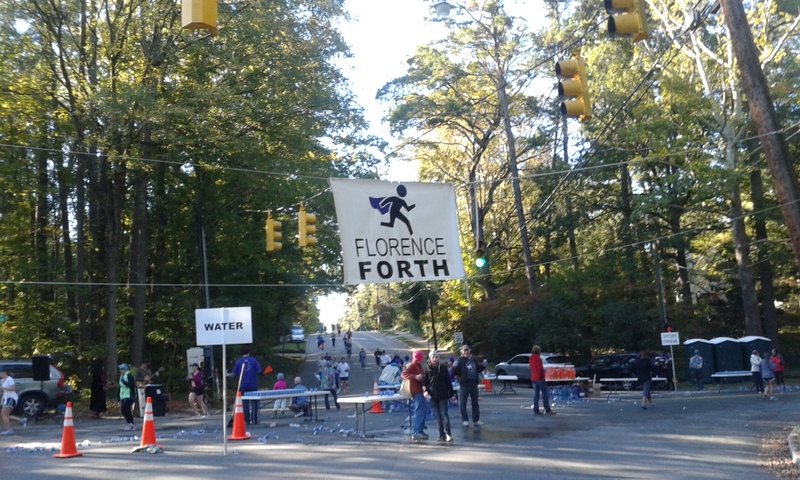 Another favorite part of a race is the signs. Below are some signs and some chalk writings. 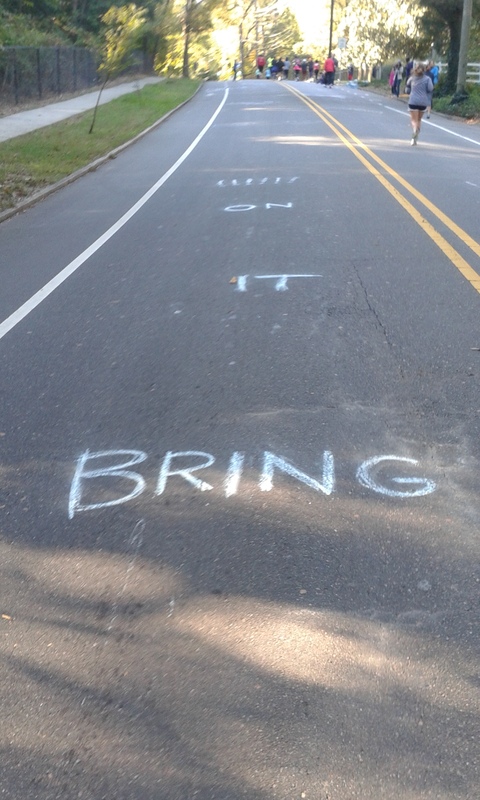 Ever since running Syracuse’s Mountain Goat 10 Miler in 2010, I have been a fan of messages on the road – especially going up hills. I also enjoyed running through the East Campus of Duke University. Took me looking back at the course map to figure out what this was as we ran around the outside before an actual out and back on the campus itself. 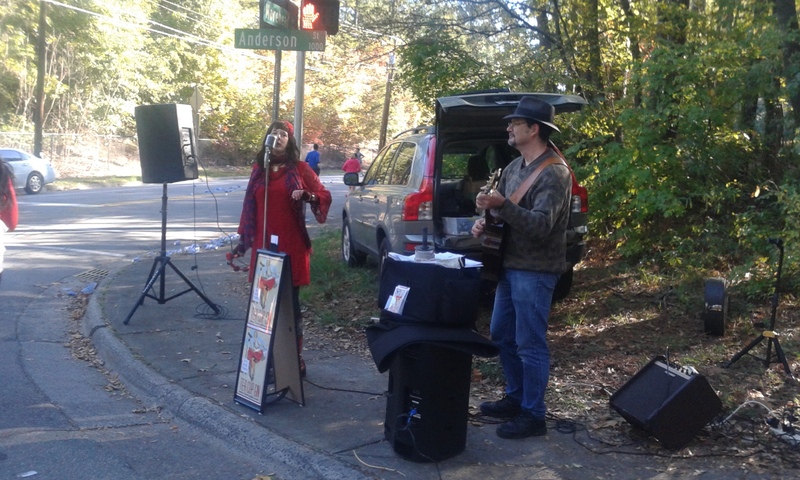 This particular race also had some great entertainment on the course. Here is my favorite. I will say that by the time I hit the last downhill my legs were screaming. It was all I could do to put one foot in front of the other as I ran down the hill. Every step hurt. I will blame this totally on being unprepared. I had had a few good weeks but I realized as I was packing to head south that I hadn’t run more than 10K at a time since July 4th and that race I walked the last two miles. My longest training run had been 5.5 miles just this past week. 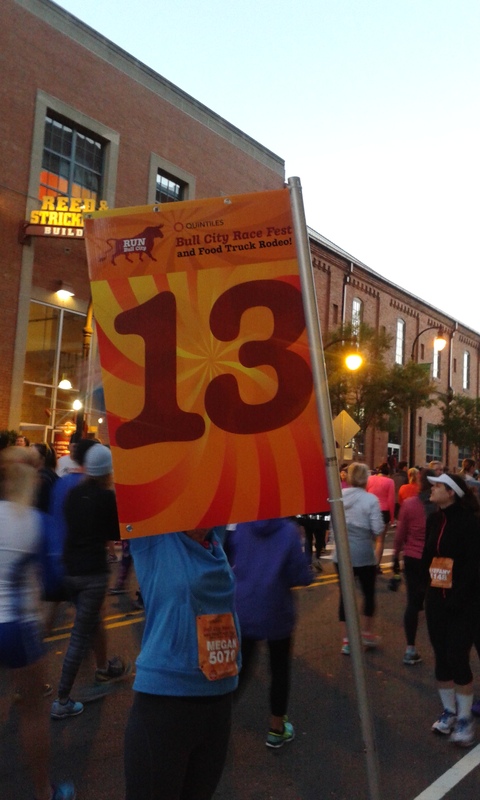 To have actually run 13.1 is a blessing. 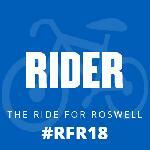 This is a race I would highly recommend for anyone. 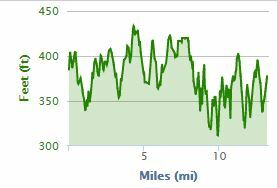 While it is extremely hilly, none of the elevation change is drastic. There are just rolling hills. 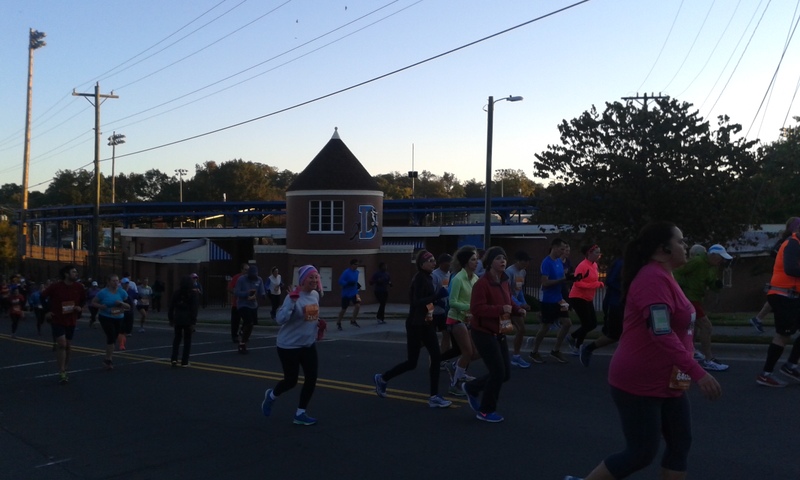 Have you ever run a Bull City Race Fest race? What distance would you prefer – 5 miles or 13.1 miles? I think that Paul would be me! I was so surprised that I could never find you. I knew about ten people running yesterday and managed to not bump into any of them. I guess with a race of over 3,000 runners it was bound to happen. Beautiful course, right? It sure would be you. Julie laughed hysterically when I told her I didn’t know the guy who hugged me and carried on a good five minute conversation with me. It is hard for me to find people without my glasses but I didn’t see your pace sign either. We’ll catch up sometime, either up here or in Asheville in March. Right, plus I’ll see on during Herald of Vistory, too. Blogger and running friend Nicki posts on a race we ran yesterday. My recap will be posted tomorrow.